Atheneum Books for Young Readers, 9781481450676, 40pp. 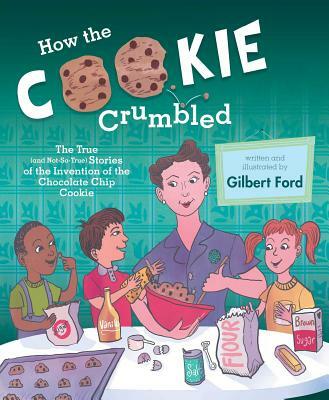 In this unique and clever picture book, Gilbert Ford sheds a little light on everyone’s favorite sweet treat—the chocolate chip cookie—and reminds readers everywhere that just because a story is told doesn’t mean it’s true. So sit back and grab a cookie to read a story—or three—about how this round, crispy, chocolatey piece of perfection came to be. Which tale is true? Well, what do you think? Gilbert Ford holds a BFA in illustration from Pratt Institute and an MFA in writing for children and young adults from Vermont College of Fine Arts. He is the author and illustrator of The Marvelous Thing That Came from a Spring, named a Best STEM Book of 2017, and has illustrated many middle grade jackets, as well as the award-winning picture book Mr. Ferris and His Wheel. He lives and works in Brooklyn, New York. Visit him online at GilbertFord.com. "A chocolate candy bar cannonballing into a possessed mixer. Baking chocolate suddenly going AWOL. These are just a couple of the persistent myths orbiting the origins of America's quintessential dessert: the chocolate chip cookie. Thanks to Ford's kid-friendly exposé, Ruth Wakefield's smarts and business savvy are revealed to be the true sources of the cookie's invention.... Ford's illustrations successfully evoke the 1930s and '40s, down to the comic-strip half-tone dot effect of the different cookie-genesis scenarios...pastry chefs in the making will be fascinated by this accessible tribute to a true American icon and will be tempted to try the appended cookie recipe." "Everyone is familiar with the deliciousness of chocolate chip cookies, but did you know some people say they were invented by accident? Ruth Wakefield’s lifelong passion for cooking and baking would eventually lead her to create the beloved chocolate chip cookie recipe. While some parts of her life story are straightforward, the actual invention of the tasty treat is surrounded by lore and legend. Readers will learn all three purported origin accounts, along with a little biography of the inventor herself...rich and expressive illustrations.... The lively, conversational writing style makes the book feel more like a whispered secret being passed down than a standard work of nonfiction. VERDICT: Great for more advanced elementary school readers who are ready to appreciate a few tasteful puns. Otherwise, a fine addition to biography collections." "The mixed-media illustrations align perfectly with the breezy, pun-filled text, aptly integrating period details, expressive facial expressions, and lots of happy crunching. This will be an enjoyable choice for one-on-one or group storytimes—just be sure to have some chocolate chip cookies handy!" "Ford moves from the history of the Slinky (in The Marvelous Thing That Came from a Spring) to that of another American classic: the chocolate chip cookie, invented by restaurateur Ruth Wakefield.... Using traditional and digital media, Ford paints a cheery vision of Depression-era America, highlighting Wakefield’s persistence and exacting nature (“Ruth’s staff said she was one tough cookie to work for”). He also taps into the visual language of vintage comics to present three ways Wakefield’s discovery might have come about: as an accident, substitution, or moment of inspiration. Ford casts his vote for the third option; readers will cast theirs for baking cookies from the recipe that’s included."